Welcome to the Department of Family Medicine Blog! 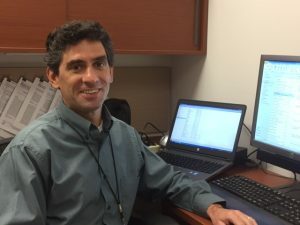 Our upcoming October 5th Department of Family Medicine Grand Rounds’ guest, Dr. Alan Simon, recently published an article in Health Affairs about access to care, specifically as it relates to receiving government housing assistance. See the article “HUD Housing Assistance Associated With Lower Uninsurance Rates And Unmet Medical Need” here. I asked him about his work in general, his career, as well as about his views on the Social Determinants of Health. Mishori: You will be speaking about housing and its relationship to insurance status and access to care. What should students/residents know about the effects of the ‘Social Determinants of Health’ on their patients’ health? Simon: Understanding the impact of social determinants of health is incredibly important. When you spend a lot of time in the hospital as a student or resident, it is easy to forget that your patients have lives outside of the hospital, and social factors that impact on their lives influence whether they have health insurance, can obtain needed medical care, purchase and take their prescribed medications, and how likely they are to have risk factors for any number of diseases. I think most physicians understand this, but keeping it in mind early in your career is harder to do. After you see your next patient, spend a minute thinking about the social factors that positively and negatively impact his or her health. Mishori: At what point did you transition from clinical care to public health? Why did you decide to make this transition? Simon: After residency, I was a Robert Wood Johnson Clinical Scholar at Johns Hopkins for two years (http://www.rwjf.org/en/library/funding-opportunities/2017/clinical-scholars.html). Following that training program, I went straight to the federal government. I managed to continue working at a clinic at Children’s National Medical Center ½ a day each week until about 2 years ago. I’ve always been a big picture person and I like to try to influence the health care system on a large scale. The government can (sometimes) allow one to do that. Nonetheless, I liked seeing patients directly as well and would like to go back to doing that at least a little bit at some point. Mishori: How did you end up working for the government? Simon: When I was looking for a job after the Clinical Scholars program, I had a few choices in the DC area where my wife and I lived. A job at the National Center for Health Statistics sort of fell into my lap and I had to decide between that and being a hospitalist. I also had very young children at the time and I thought that working for the government would be more family friendly. For the most part, that has been true. Also, I wanted to be able to concentrate on research and I thought that hospitalists were so busy that they didn’t have enough time to dedicate to projects early in their career. Mishori: What does it mean to be a ‘medical officer’? What do you do at the Department of Health and Human Services? Simon: Medical officer just means that you are an MD (or a DO). I now work for the HHS Office on Women’s Health in the Office of the Assistant Secretary for Health. I do a little bit of research still, but mostly try to keep programs running. My responsibilities are fairly varied. I am the lead for building a website that analyzes data from a variety of national data sets on the fly. I work with the Indian Health Service on addressing the misuse of opioids in women. Mishori: You have a profile picture of a mountain gorilla on your ResearchGate page, what’s the story behind that? Simon: He is my spirit animal. Actually, when I went to sign up for ResearchGate, I couldn’t get past the step where I had to put in a picture. I didn’t have a picture of me on my computer, so I put in a picture of a puppy chasing a butterfly. People seemed to really like the picture, but when I changed jobs and had to create a new account, I decided to go with the gorilla instead. Maybe researchers all over the country think that I am a gorilla, but it seems unlikely. Mishori: Finally, what advice can you give students/residents about selecting a specialty or a role within the healthcare system? Simon: I’m sure everyone says this, but it is important to like the bread and butter of the field and make sure you spend time with people in that field that are not at the tertiary care center of your medical school. The rare cases are always going to be rare and they are not usually enough to keep you interested in a field. As a reminder, you can join Grand Rounds in person or via Zoom. Thursday, October 5th. 8am. Warwick-Evans room. Building D.
This entry was posted in Uncategorized on September 24, 2017 by Ranit Mishori. That’s Grand! Featuring Dr. Margot Savoy.